Janis makes her own sauce - a marinara sauce with seasoned ground beef. You can use bottled spaghetti sauce. Crumble fry 1 pound of hamburger, drain grease and then add meat to the bottled sauce. You need about 4 cups of sauce. Cook noodles as directed on the package. Drain and set aside. 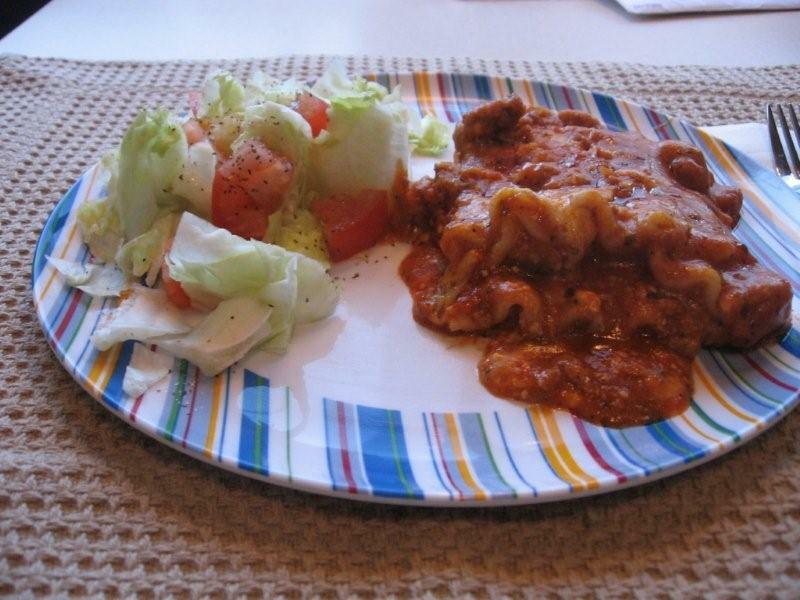 In a large baking dish, place a thin layer of the sauce to cover the bottom of the dish. Cover the sauce with a single layer of the lasagna noodles. Add a layer of the sauce, sprinkle with parmesan, add a layer of the Ricotta cheese and then a thin layer of the Mozzarella cheese. Repeat, ending with a layer of Mozzarella cheese, until all ingredients are used. Bake in a 350°F oven for 45 minutes or until cheese is hot and bubbling and starting to brown. Let sand 15 minutes before cutting and serving.